↑S.S. 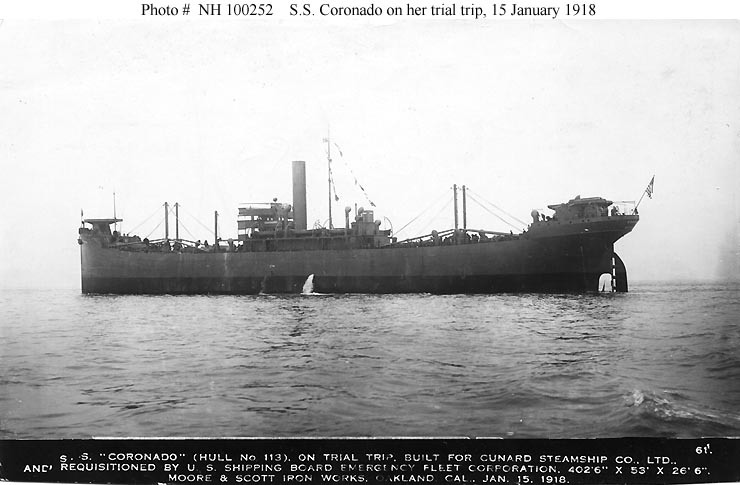 Coronado (American Freighter, 1918). Photographed on her trial trip, 15 January 1918, probably in San Francisco Bay, California. Built by the Moore and Scott Iron Works of Oakland, California, as their Hull # 113, this ship was originally ordered by the British Government for operation by the Cunard line as War Bay. Taken over by the U.S. Government after the United States entered World War I, she was similar to many ships built under U.S. wartime emergency ship construction programs. U.S. Naval Historical Center Photograph. Image courtesy of HyperWar.